Cottontails Baby: Maileg bunny competition - winner announced! Maileg bunny competition - winner announced! 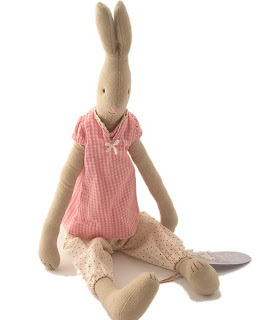 Congratulations to Katy Robson in Australia who has won our 'name the Maileg bunny' competition. Katy came up with the name 'Bronte' which I really loved because a) it is a pretty name and b) Jane Eyre is my mother's very favourite book. I wanted to thank everyone who entered - we had hundreds of entries! Other favourites included Meg, Clover, Crumble, Freya, Harmony, Florence, Bea, Emily, Beatrice and Emily. They're all such pretty names aren't they? So thank you... this has been our first attempt at a competition and I've been delighted with the response. I have just emailed our web designer about putting together a new competition - this time for a Moulin Roty toy - and will let you know when it's all up and running. But in the meantime thank you again to everyone who entered and warm congratulations to Katy for her lovely suggestion. Bronte is a great name!